View the On-Farm Survey Results of Western Corn Rootworm Larval Damage in Corn after Soybeans. In the past, corn rotated annually with soybeans was not susceptible to rootworm larval damage because western corn rootworm (WCR) adults laid eggs only in cornfields. Therefore, rootworm eggs were not present in corn planted after soybeans. In addition, rootworm larvae could not survive on soybean roots, so larvae that hatched from eggs laid in corn the previous year starved to death. 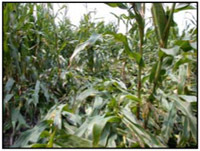 Consequently, crop rotation was the most reliable tactic for managing western corn rootworms. However, because of the routine rotationof corn with soybeans for decades in east-central Illinois, a new strain of WCR has adapted and lays its eggs in soybean fields. In 1995, incidents of rootworm larval damage in corn planted after soybeans increased dramatically, and WCR adults were found in both corn and soybean fields. Rootworm larvae in first-year corn can cause severe root injury, which may result in lodging and physiological yield reductions. Research has been conducted and shown the western corn rootworm variant also lays its eggs in alfalfa, oat, and wheat stubble, although to a much lesser extent. Rootworm damage to corn planted after soybeans has occurred in many locations. The range of the western corn rootworm variant has continued to grow, especially to the west and northwest of the originally affected area (see maps). WCR populations are highly variable, so monitoring should be done annually and treatment must be made on a field-by-field basis. An adult management approach to prevent egg laying by WCR in soybeans is not recommended. Until sampling strategies and economic thresholds can be developed, growers are encouraged not to attempt this strategy to prevent corn rootworm larval injury to corn planted after soybeans. It is recommended to scout soybean fields to determine the need for a rootworm-control product the following year. A economic threshold and scouting procedures have been developedfor WCR in soybean fields, that will allow growers to make informed decisions regarding the need for a rootworm-control product in first-year corn on a field-by-field basis. Growers located in high-risk (red) and moderate-risk (yellow) areas in Illinois should monitor for WCR in soybean fields where corn will be planted the following year. We recommend that growers determine WCR densities by scouting soybean fields from the last week in July though the third week in August using Pherocon®AM Yellow sticky traps. In the last week of July, distribute 12 unbaited Pherocon®AM traps evenly throughout the interior of each field (regardless of field size). 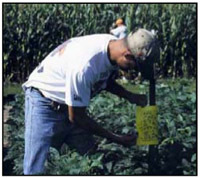 The traps should be positioned just above the soybean canopy on metal fence posts. Each week, count all the WCR (maleand female) found on each trap in each field. Be sure to replace the traps every seven days to ensure accurate WCR counts. Growers interested in determining the presence or absence of WCR adults in soybean fields in their region can follow the same procedure, but distribute only four traps per field. CAUTION: This modified procedure should not be used to make decisions regarding the use of rootworm-control products. 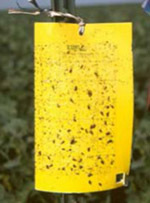 If WCR adults are detected, you should determine densities by monitoring your fields with 12 traps, as described above. 2. Use the chart below to predict the level of injury in each fieldscouted, based on the average number of beetles per trap per day. For example, if trap captures in a soybean field average 3 beetles per trap per day, roots in a first-year cornfield may average 1 or 2 on the injury rating scale thefollowing season. An economic threshold of 10 beetles per trap per day may result in a root injury of 4.0 (one node of roots destroyed). No visible damage, or only a few minor feeding scars. Some roots with feeding scars, but none eaten off to within 1.5 inches of the plant. Several roots eaten off to within 1.5 inches of the plant, but never the equivalent of an entire node of roots destroyed. One node of roots destroyes (or the equivalent). Two nodes of roots destroyed (or the equivalent). Three or more nodes of roots destroyed. The root rating scale, showing examples of larval root injury. Extension entomologists recommend that growers in Illinois who have experienced rootworm larval injury in first-year corn and have found WCR adults in adjacent soybean fields monitor their soybean fields using Pherocon®AM traps to determine the need for a rootworm-control product in first-year corn.The level of root injury that may result in economic loss variesaccording to the growing season and the hybrid selected. In general, economic injury occurs with root injury ratings between 3.0 and 4.0. However, for certain corn hybrids during poor growing conditions, recent research has shown yield losses can occur with root ratings between 2.0 and 3.0 (minor root scarring to minor root pruning). Growers scouting soybean fields using the procedures described here may report data directly to extension entomologists by completing the Western Corn Rootworm Scouting Report Form.